Eine (sicher unvollständige) Liste von Fursuit-Bauer die ich mal zusammengestellt habe und sicher noch ergänzen werde, vielleicht ja trotzdem von Interesse. Neben bekannten amerikanischen Namen tauchen auch einige europäische Bauer auf. Die Liste berücksichtigt Bauer die mindestens einmal im letzten Jahr aktiv waren. Preise (umgerechnet auf US-$) sind Startpreise wie sie von den Bauer für einen einfachen Fursuit ohne Schnickschnack angegeben wurden. Fursuit maker name - Link to homepage - Preferred fursuit style (toony/semi-realistic/realistic) - If fullsuits or only partial suits, fursuit parts - ~Price-class (starting with a simple full fursuit, this doesn’t cover customized and complex fursuits. The maker’s quote is what counts in the end). As opening times vary so much, they are not listed, but generally can be found on the homepages. Artslave Costumes - https://twitter.com/Artslavefursuit - Fursuit maker based in USA, specialized in realistic and fantasy creature fursuits. Mostly partials, full fursuits optional. Beasts and Beyond Creations - https://beastsandbeyondcreations.wordpress.com/ - Fursuit maker specialized in realistic and fantasy creature fursuits. Mostly partials and fursuit parts (like heads). Prices for a partial fursuit start at 2,700US$. Beta Raptor Creations - https://www.furaffinity.net/user/betaraptor - Fursuit maker specialized in toony fursuits. Mostly fursuit parts and partial fursuits, fullsuits optional. Bycats4cats - http://bycats4cats.com/ - Fursuit maker based in Minnesota (USA), specialized in toony fursuits, especially feline kind. Mostly partial fursuit and fullsuits, also fursuit parts. Prices for a full fursuit start at 2,900US$. Cant of Togs - https://www.cantoftogs.com/ - Fursuit maker based in USA, specialized in toony fursuits. Partials and fursuit parts. Prices for a partial fursuit start at 1,500US$. CffStudios - https://www.cffcostumes.com/ - Fursuit maker based in USA, specialized in toony to semi-realistic fursuits Mostly partials, fullsuits and fursuit parts. CFStudios - http://www.cfstudiosonline.com/ - Fursuit maker specialized in toony fursuits and cosplay. Mostly partials, fullsuits and fursuit parts. Prices for a full fursuit start at 2,900US$. Chaos Costumes - https://www.facebook.com/ChaosCostumes/?hc_location=ufi - Costume maker specialized in fursuit and cosplay parts, like hooves and horns. CoconutJellyCreation - https://www.etsy.com/shop/coconutjellycreation - Fursuit maker specialized in toony fursuit parts and supplies. Mostly partials and fursuit parts. Color Carnage - https://www.colorcarnage.net/ - Fursuit maker specialized in toony fursuits. Fursuit parts, partials to fullsuits. Prices for a fullsuit start at 2,500US$. Crystumes yCostumes -https://crystumes.weebly.com/ - Fursuit maker based in Washington (USA), specialized in realistic fursuits, fantasy and movie creatures. Mostly fursuit parts and partial fursuits. DrakonicKnight - http://www.furaffinity.net/user/drakonicknight/ - Fursuit maker based in the USA, specialized in realistic fursuits. Partials and fursuit parts, rich collection of resin casts. Dream Vision Creations - - Specialized in fursuits supply. Rich collection of fursuit parts, including resin and foam masks, horns, hooves. Fursuit This Suits You Up! - http://www.fursuitup.com/ - Fursuit maker based in Europe, specialized in toony fursuits. Mostly partials and fursuit parts. Fursuits UK - https://www.instagram.com/fur.suits_uk/ - Fursuit maker based in the UK, specialized in toony fursuits. Mostly partials, full fursuits and fursuit parts. FurZombie Studioss - https://furzombiestudios.com/ - Fursuit maker based in Wisconsin (USA), specialized in toony and fantasy creature fursuits. Partial and full fursuits. FuzzButtFursuits - https://fuzzbuttfursuits.com/ - Fursuit maker based in Florida (USA), specialized in toony fursuits. Fursuit parts, partial and full fursuits. Prices for a full fursuit start at 1,500US$. Primal Visions - http://alexisrudd.com/ - Costume maker specialized in realistic fursuits, fantasy and movie creatures. Mostly fursuit parts and partial fursuits. Kandorin Creations - https://kandorin-creations.myshopify.com/ - Fursuit maker specialized in semi-realistic fursuits. Partials and fursuit parts. Rich collection of resin masks and bases. Kittlums Fursuits - https://kittlums.weebly.com/ - Fursuit maker based in New Zealand, specialized in premades and toony partial fursuits. Partials and fursuit parts. Prices for a partial fursuit start at 1,000US$. LE COIN D'IRINAE - https://www.facebook.com/lecoiniri/ - Builder based in Belgium, specialized in toony/realistic/kemono fursuits. Starts at 500€ for a head. LobitaWorks - http://lobitaworks.com/ - Fursuit specialized in toony fursuits. From partials to full fursuits. Melissa Mendelson Art - https://www.melissamendelsonart.com/finished-works - Fursuit maker based in Ohio (USA), specialized in realistic fursuits and costuming. Rich collection of fursuit parts (resin masks). MilkMade - https://trello.com/b/pvoJsONp/milkmade-commissions-queue - Fursuit maker specialized in toony fursuits. Mostly partials, fullsuits and fursuit parts (like plush hooves). Mixed Monsters - https://tinyurl.com/yc6gfvde- Fursuit maker specialized in premade fursuits. Partials and fursuit parts. Neon Furstudios - http://www.neonfurstudios.de - Fursuit maker based in Germany, specialized in toony fursuits. Partials to full fursuits and fursuit parts. Mordrude’s Monsters - http://www.mordrudesmonsters.com/ - Fursuit maker based in the USA, specialized in realistic fursuits and fantasy creatures. Mostly fursuit parts, partials and full fursuits. MuttMix - http://madebymuttmix.com/ - Fursuit maker based in the USA, specialized in toony fursuits. Mostly fursuit parts, partials and full fursuits. Prices for a full fursuit start at 2,000US$. Nuke Creations - http://nukecreations.com/ - Fursuit maker specialized in toony fursuits. Partials to full fursuits and fursuit parts. Prices for a partial fursuit start at 2,600US$. OMEGAPAWS - http://kuchi.kushi.free.fr/omegapaws/USindex.php - French builder, specialized in toony fursuits. Full fursuits starts at 1,400US$. OMG Pineapples - http://www.omgpineapples.net/ - Fursuit maker specialized in toony fursuits and mascot costumes. Fursuit parts, partials to fullsuits. SchneepardiCreations - http://www.furaffinity.net/user/sethaa/ - Fursuit maker specialized in toony fursuits. Partials, full fursuits and fursuit parts (3D-printed masks). Shagpoke Studios - https://www.patreon.com/ShagpokeStudios - Fursuit maker based in the UK, specialized in toony and semi-realistic fursuits. Fursuit parts, partials and full fursuits. Stoof Studios - https://www.facebook.com/StoofStudios/ - Fursuit maker specialized in toony to plushy fursuits. Full fursuits. Streifenschnauzer - http://www.furaffinity.net/user/streifenschnauzer/ - Fursuit maker based in Bavaria (Germany), specialized in semi-realistic fursuits. Mostly fursuit parts and partial fursuits. Prices for a full fursuit start at 700US$. Suitadile - http://www.furaffinity.net/user/suit-a-dile - Fursuit maker specialized in toony and plush fursuits. Mostly fullsuits. Suits Fur The Soul - https://tinyurl.com/ybg2g93z - Fursuit maker specialized in toony fursuits. Mostly partials, fullsuits and fursuit parts. Synthetic Style Creations - https://tinyurl.com/yc9tlbvq - Fursuit maker specialized in toony fursuits. Mostly fursuit parts and partial fursuits, fullsuits optional. Templa Creations - http://www.templacreations.com/ - Fursuit maker based in Finland, specialized in toony to semi-realistic fursuits. Partials and full fursuits. 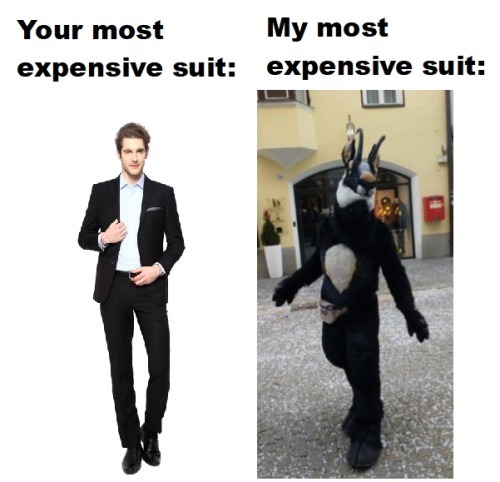 Prices for a full fursuit start at 3,000US$. That’s Furred Up! - http://thatsfurredup.com/index.html - Fursuit maker based in the USA, specialized in toony fursuits. Mostly partials and full fursuit. Prices for a full fursuit start at 2,500US$. The Phoenix Nest - http://the-phoenix-nest.com/ - Fursuit maker specialized in toony fursuits. Partial fursuits and fullsuits. Prices for a full fursuit start at 3,000US$. Toony Stuff Suits - https://tinyurl.com/ybaseovl - Fursuit maker based in germany, specialized in toony fursuits. Partial fursuits and fullsuits, fursuit parts. Tsebresos - http://tsebresos.com/ - Fursuit maker based in USA, specialized in toony fursuits. Partials and full fursuits, fursuit parts. Prices for a full fursuit start at 2,500US$. Twinky Arts - http://www.twinkyarts.net/ - Fursuit maker specialized in toony fursuits. Fursuit parts, partials and full fursuits. Prices for full fursuit start at 3,800US$. Twitchin’ Whiskers - https://www.twitchinwhiskers.com/ - Fursuit maker specialized in toony to semi-realistic fursuits. Mostly full fursuits, fursuit parts and partial fursuits. Prices for a partial fursuit start at 1,300US$. Wanderlust Suits - https://www.wanderlustsuits.com/ - Fursuit maker based in USA, specialized in toony and semi-realistic fursuits. Mostly fursuit parts, partial fursuits and fullsuits. Prices for a full fursuit start at 1,800US$. West’s Custom Creations - http://westscustomcreations.storenvy.com/ - Fursuit maker specialized in toony to semi-realistic fursuits. Partial to full fursuits and rich collection of fursuit parts (resin and foam masks). WhatsUpHotDog - https://www.wuhdfursuits.com/ - Fursuit maker based in California (USA), specialized in toony and semi-realistic fursuits. Mostly fursuit parts, partial fursuits and fullsuits. Prices for a full fursuit start at 3,500US$. WMW66-Costumes - http://www.wmw66-costumes.com/ - Fursuit maker based in the Czech Republic, specialized in toony to semi-realistic fursuits. Mostly partial fursuits. Prices for a partial fursuit start at 1,800US$. WolfSkinSuiting - https://twitter.com/WolfSkinSuiting - Fursuit maker specialized in toony and semi-realistic fursuits. Mostly fursuit parts and partial fursuits, fullsuits optional. Prices for a full fursuit start at 850US$. Zuri Studios - http://www.furaffinity.net/user/zuristudios - Fursuit maker based in Europe, specialized in toony and fantasy creature fursuits. Full fursuits. Nichts für ungut und Danke für die Mühen, aber man muss leider sagen, dass die von Misha gepflegte Liste im größeren Nachbarforum ein wenig größer und auch übersichtlicher ist. Außerdem würde sich ein deutschsprachiger Text in einem deutschsprachigen Forum besser machen, findest du nicht? Immerhin gibt es immer noch viele Furs hier, die kein Englisch können. Wie seid ihr eigentlich auf euren Fursuitbauer gekommen?